A lot has happened since the last update. Some of it is good news and some of it is bad. First the good news. All tooling was picked up from Lodi Iron Works and delivered to Globe Iron Works in Los Angeles. I spent between 3 and 4 hours at Globe Iron Works explaining how each core box worked and how the core assembly was made. They understood the core assembly procedure, had few questions and asked if they could vent all core boxes so that they could be blown. I replied that they could vent the core boxes. A blown core is more dense (stronger) than a hand packed core. At Lodi Iron Works, all cores were hand packed with the exception of the water jacket which was blown. Price wise, Globe Iron Works agreed to match Lodi Iron Works price which was just over $800 for a cylinder block casting. Lodi Iron Works came up with the $800 price after making several castings while trying to solve the porosity problem. An order for 5 cylinder block castings was placed with Globe Iron Works. After 6 weeks without any progress, I threatened to pull the job. Two days later, I received an Email that showed a pallet full of cores. Another 6 weeks passed without progress and I again threatened to pull the job. A few days later, I received an Email with a picture showing their first casting attempt. That casting had a cold shut at the water jacket, but otherwise looked good. A cold shut is where the leading edges of molten metal don't fuse together. A cold shut can be caused by interrupting the pour, pouring too slow, or pouring with the molten metal at a temperature that is too cold. When I spoke with the supervisor that was on duty, his reply was that he was not there and had no idea of what happened. To summarise the good news, all tooling and following the procedure to make the assembly of the cores worked at a new foundry. The bad news with Email exchanges is that Globe Iron Foundry is not interested in making cylinder blocks. Since I am 400 miles away, Globe Iron Works was kind enough to deliver all tooling to Pacific Alloy Casting in South Gate, CA. And now for the bad news. Pacific Alloy Casting evaluated the tooling and said that the cost of a cylinder block casting would be $2400 because it would require sand that is different from the sand that they normally use. The $2400 quote is not a price that makes this project affordable, so the tooling was retrieved. Phone calls and Emails to several other foundries resulted in only one that was interested, and that was Ridge Foundry in San Leandro. Ridge Foundry is about 35 miles from where I live and I didn't consider them in the beginning because they are a small foundry. The tooling was deliverer to Ridge Foundry, and again everything was explained regarding making the cores and core assembly, Since Lodi Iron Works had problems following the procedure for core assembly, I asked Ridge Foundry to quote this job in 2 ways. The first way was to have Ridge Foundry do everything, and the second way was to have Ridge foundry make the cores and let me assemble them. Ridge Foundry would only quote with them doing everything. It took 6 weeks, several Emails, and several phone calls to get a quote.Their price was $3400 for the first casting, and $2400 for all castings thereafter. These prices could be justified if the cylinder block was for a Duesenberg or some other exotic automobile, but not for a Model A Ford. The goal of this project was to supply a fully machined cylinder block, crankshaft, and 4 connecting rods for between $3000 and $4000. The other necessary parts would add another $1000 to build a complete engine. One good cylinder block, crankshaft, and set of connecting rods with caps has been cast, so there are no issues with the tooling. The only issue now is cost. My experience with west coast foundries is that they are not familiar with thin wall complicated castings and would rather pour thick wall castings with simple or no cores. For a data point, and to put things in perspective, a brand new (not rebuilt) small block Chevy 350 cubic inch, 195 HP long block engine including heads, pan, and shipping can be bought for $1485.00 (Ebay #171296532729). For now, the tooling is in storage. If anyone on the east coast knows of a foundry and machine shop and has the expertise to continue this project, please contact me. Unless you have been directly involved in the casting and machining of a similar casting, please do not contact me. 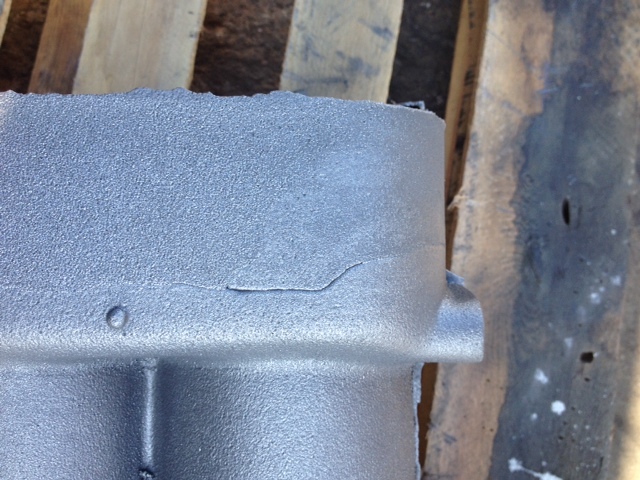 Attached is a photo of the casting made by Globe Iron Works that shows the cold shut. From other photos, the casting appeared to be good. The bump on the casting between cylinders 3 and 4 represents a chaplet found on original Ford cylinder blocks that was ground flush.